Houzz 95 of our visitors have told a friend about this plan. Upon entering through the grand entry into the foyer, you will be astounded at the view of your spacious great room area and grilling porch with an optional outdoor fireplace. The master suite and bath complements each other perfectly with its whirl pool tub and glass shower and did I mention walk in closet space. Enjoy the atmosphere that this home will provide in comfort and in style. Question: How high are ceilings in this plan? Is the foundation plans for 8 ft foundation wall? Do plans included the truss layout and dormer sizes, pitch of roof? Answer: Question: How high are ceilings in this plan? Standard nine foot plan line aka wall height aka ceiling height Is the foundation plans for 8 ft foundation wall? The basement is noted an 8 foot height; however we are slowly updating to show a 9 foot; Simply ask your builder to use another row of block or pour to your desired basement ceiling height; Considering your HVAC ductwork and other mechanicals. NOTE: You must consider the staircase to be sure you have space for additional treads and risers to accommodate the higher basement ceiling. Do plans included the truss layout and dormer sizes, pitch of roof? Ask for the roof framing detail when you order. We call for stick built as many trusses are regional and not available in every region; have your truss provider Do a layout for you – no additional fee as they want your business. Question: We would like to see this plan with a walkout basement. Our lot would do extremely well with this option. Question: What is the turnaround time for the 1 set in readable reverse with basement? Answer: This particular version this plan was published in 2009, we include the 2015 IRC’s with each of our plans with the exception of our log plans. Answer: This is not yet available send. Question: What are the window sizes on the back of the house? For our HOA, we need at least a 4:12 pitch. What is the pitch of the porch roof? Question: It is mentioned in Designer Q&A that this plan was going to be modified with Attic/Bonus Room in future. Is that now available? Thanks. Answer: This should be available within the next 2-3 months. Question: Is the great room vaulted? Question: Are the timber beams structural or for decor only? Question: Is the version of this house with a bonus room available yet? I'm also interested in your plan #82162 but would like to be less sq ft overall but still including a bonus room (so 82179 doesn't work). Thanks! Answer: This plan is not yet available with a bonus room. Question: What is show in plan for butler's pantry? IM REF? Question: Are the timbers in the great room/kitchen decorative or used for support? Question: I love the floorplan of this house but want to make make the porch a little more grand with an elevated pitch and remove the doormers, just like above the windows. Would this be possible or do you have other exteriors with this same plan or very close? Answer: This is certainly possible as a modification. Question: Is the new version of this house plan with bonus room available yet? If so, how can it be found online for viewing? Answer: We have not yet made this one available. Question: Is there enough head space in the attic to convert it to bonus room. If so, how high would the ceilings be? Question: Is there enough attic space to make into a bonus room? Question: Is there a second floor bonus area or attic? 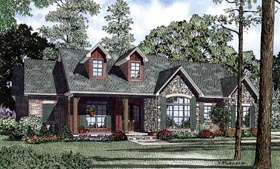 Question: I absolutely love this house plan, but it is a bit too large for me. Do you have a similar plan in the 1700-1800 sq ft range? Thank you, Tonya B. Answer: Do you like the interior or exterior of the plan?